This is a picture of the picture hanging above our living room couch. Yes it's a bit of a joke. But the real joke is the amount of people that have come through our house and not made any comment! 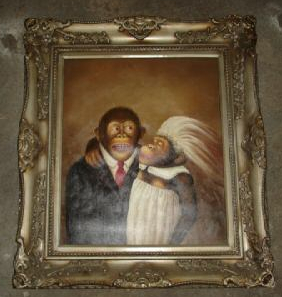 There is a three foot painting of monkey's on our wall --- it's not really something you can overlook. Are people just too polite to comment. Do you think the neighbors/landlords just think it's our taste? It still makes me laugh everytime I look at it. AHAHAHAHAHAHHA! OMG I can't stop laughing. That picture is cute and weird all at the same time. While I'm not certain if this is an item that, how can I put this, is your "taste", it certainly does not surprise you that this is what you have hanging above your living room sofa. Where ever did you procure this item? Yeah, they think you're serious! THey probably burst out laughing after they leave, saying: "WTF was up with those MONKEYS????". Ha ha. Why DO you have that thing on your wall? Does its hideousness bring you that much pleasure? but it's so poetic.. and lovely.. because, underneath it all - aren't we all really just monkeys in love? I think it's a beautiful statement. actually, YES, ms ms,it's hideousness does bring me that much pleasure! and OOTG, I procured it in NYC. I saw it and could not resist. thank you Hickart for you appreciation of it's inner beauty and meaning. Is it me or does the man monkey resemble mr. shenanigan? Um, I'm happy to report that I think it's "just you".